Welcome to my 100th blog post! Yikes! This week's Diva Challenge #99! is from guest blogger/CZT Margaret Bremner. 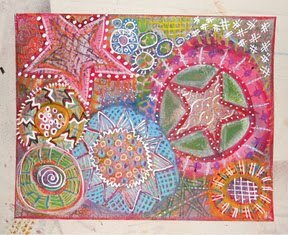 She has challenged us to creating a zentangle tile using a "looped border string". Well, I've been feeling a bit loopy these days, so why not create a tile? Here it is, using Nightsbridge, Purk, Scallops, Bales, Sand Swirl, Jealousie, Wisket Gloven, Tripoli, and Zedbra. Click on photo to enlarge. My heart is heavy thinking about the families and community of Sandy Hook, CT. May you find the strength to carry on. My thoughts and prayers are with you all. You made a beautiful tile; I like Purk in every corner, it makes it quite bekanced. Holland may be far away, but I also feel so much pain for the families that lost a loved one. Beautifully done tile! Your blank spaces really add dimension. Well done. The Diva Dance...I'm liking it.